It’s too early to say definitively, but 2015 looks set to be a good quality vintage across most parts of Australia. It’s an early vintage though; we thought we would be there ahead of the harvest when the winemakers and growers were sitting around waiting for it all to happen…! Some people are fully four weeks ahead of schedule with most of the whites already in tank and the red on their way in from the vineyards. From start to finish the vintage would usually last around 90 days for many producers but most thought it would all be over within 60 days. We started the trip on 23rd February in Mornington Peninsula, south east of Melbourne. You’ve heard talk of this being a cool climtate growing region – believe it! It was a sunny 26 degree when we left the city but just forty minutes drive away in Mornington it was 16 degrees and raining! Yabby Lake, Crittenden Estate and Ten Minutes by Tractor were all on our list that afternoon. There is some really classy Pinot Noir and Chardonnay coming out of this region – even the most committed Burgundy fans would be pleasantly surprised. Lovely bright varietal fruit character, crisp natural acidity and well judged French oak. From Mornington we headed up to the Yarra Valley where we tasted with our existing supplier De Bortoli plus two old friends – Yering Station and Punt Road. There is a lot of interest and experimenting going on with Sangiovese and other Italian varietals in this region as well as some burgeoning interest in Malbec! There is certainly plenty more to Australia than big oaky Chardonnay and bold blockbuster Shiraz. The big differences in site and aspect are also easy to see once you get out and see how cool and high some of the vineyards are. On Wednesday 25th we flew from Melbourne to Adelaide and from there straight to the McLaren Vale. First stop was Tintara, part of the Hardy’s estate, where we had a full tasting with head wine maker Paul Lapsley – a very impressive line up of wines, the stand outs of which being the Eileen Hardy range. All wine makers do things a bit differently, but none more so than Sarah and Sparky Marquis at Mollydooker. It’s Aussie for Left Handed. They use a specially developed irrigation system here and harvest their grapes later than most of their neighbours to produce powerful, rich and supple wines that drink perfectly from bottling (insert photo of us tasting at Molly Dooker). The Molly Dooker cat, Jack, also took rather a liking to Justin! In Black Cat, Silver Fox met his match. In McLaren Vale we also visited our long standing friends Kevin and Helen O’Brien from Kangarilla Road winery. They have a fantastic new tasting room – for any of your heading down under, definitely worth a visit! Later that same day we also went to d’Arenberg where the wines – as usual – did not disappoint. Full of personality and class. Our final stop in McLaren was at Wirra Wirra where we tasted through another great line up of wines. We have a special small parcel of the Lost Watch Riesling coming in late April – a trophy winner and one to look out for (while it lasts!). I knew we should have packed a bigger glass. Up and across into the Adelaide Hills we visited Shaw & Smith , a very stylish operation that is really going places with the talented Adam Wadewitz at the wine making helm. . Here you can see the 2015 M3 Chardonnay just off the wine pre press! Justin was unfamiliar with the concept of wine pills. Further north and up towards Barossa the mercury struck 38 degrees as we reached Yalumba. Yet another awesome, diverse range of wines made by Chief Winemaker Louisa Rose who has been at Yalumba for 23 years. Her commitment to quality and excellence is evident right across the extensive range she is in charge of vinifying here. Yalumba were never sure if their flagpole for children would catch on. At Two Hands in Barossa we bumped into Zoe Wilde, Manager of our Dundee store, who was in the midst of helping out with the 2015 vintage (and she had the red wine stained hands to prove it!) Here the wines are big on personality, reflecting the passion and dedication of winemaker Michael Twelftree. A treat to finish the tasting here – the delicious “Fait Accompli” fortified Muscat. On from there to Peter Lehmann, byword for quality and consistency in the Barossa Valley and another long standing partner of Majestic. Just the 39 years at PL for Winemaker Andrew “Wig” Wigan!! Not known to Majestic, next we visited Rolf Binder, also in the Barossa Valley. Probably the most impressive vineyard we saw in the whole trip – a plot of 125 year old, ungrafted, bush vine Mataro. Rolf’s wines are intense, complex and varietally true. Great to meet you Rolf and thanks for giving up your Sunday to host us! Further north in the Clare Valley we visited Jim Barry. The people, the wines, the place all so full of character – this was a very memorable visit! 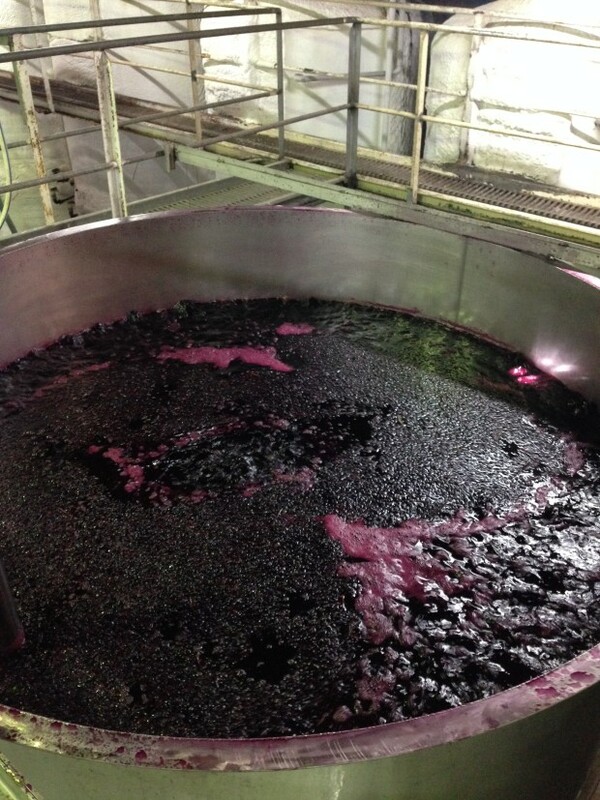 Malbec is on the agenda here too – here is the 2015 fermenting away! A fantastic tasting through the range with team Barry was followed by a trip up to their Lodge Hill Vineyard where we sipped their 2007 Riesling and watched few kangaroos bounce pass – very civilised! The final day of the trip took us to Taylors, Wolf Blass and Penfolds. All with impressive line ups of wine and worthy of the international renown these wineries each have. Meeting and tasting with Peter Gago of Penfolds at the beautiful Magill Estate was a great way to finish the trip. Plenty more besides, but highlights from this tasting were three vintages each of Bin 389, St Henri and Grange…I’ll admit it, there are worse jobs.